For a long time I've always shied away from this subject, but it turns out that I shouldn't have: shapes in VBA are surprisingly easy to create and control! The code to create these two shapes is shown in the formatting section of this blog. 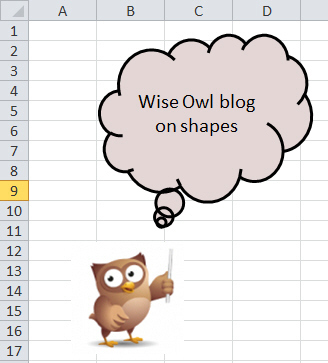 This blog goes into the minutiae of how to create autoshapes in VBA. All of the examples are for Excel, but they'll work just as well for PowerPoint VBA or Word VBA. First, however, there are two things that you can do to make your shape-life easier (it sounds like something out of a bad science fiction novel ...). You can easily survive using shapes without recording anything, but being able to record commands can make life much easier! 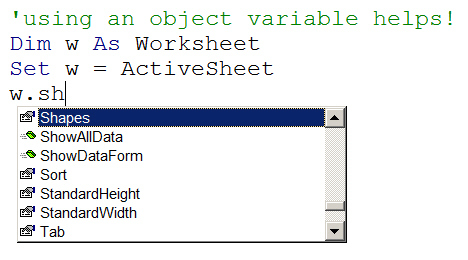 If you use a variable of type Worksheet, VBA knows what you're talking about and can help you. With those two tips out of the way, let's start with the basics of working with shapes!